Loch Ness and Glencoe boast some of the most breathtaking views in Scotland. Let us take you there on an affordable, tailor made tour. Take a Capital Cars tour to one of the most popular attractions in Scotland - Loch Ness. Get ready to unearth some of Scotland’s most memorable scenery. We will pick you up at your hotel and then head North from Edinburgh. On the way we will stop to take a look at the spectacular Forth Bridges. We then carry on past the imposing ramparts of Stirling Castle into the Trossachs National Park, which is centred on Loch Lomond. Next, we cross the wilderness of Rannoch Moor before stopping at the dramatic Glencoe. This area boasts striking mountain scenery and is a popular spot for hill-walkers. The dramatic views you will see have also featured in numerous films, including Harry Potter and the Prisoner of Azkaban. Our private tour continues along the banks of Loch Linnie to Fort William, where we will pass the breathtaking Ben Nevis - Britain’s highest mountain - before entering The Great Glen. Arriving at Fort Augustus on the banks of Loch Ness, you can cruise on the loch, go for a walk or just relax by the Caledonian Canal. Whatever you decide to do, rest assured that the views will be stunning...just keep your eye out for Nessie! Our return journey takes us past the Laggan Dam and Dalwhinnie Distillery before entering the lonely and wild Drumochter Pass. 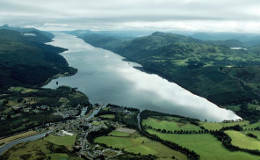 Heading South, we then enter Perthshire, a beautiful land of forests and rivers. Last on the agenda is an early evening walk to the wonderful Black Linn Falls before heading back to Edinburgh. Capital Cars will cater for groups of up to eight people, and promise that your journey to Loch Lomond and Glencoe will be a day to remember.